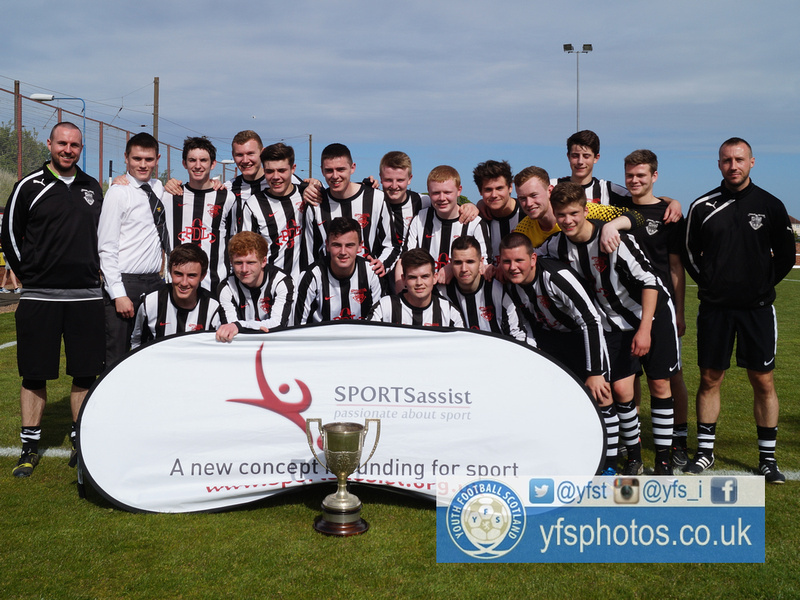 Dunipace Juniors defeated AC Oxgangs 1-0 in a tense South East Region Cup final in Dunbar. AC Oxgangs started the match strongly, and came close to opening the scoring within 10 minutes. An early corner from the left side was half cleared to the edge of the area where Harvey Blackie hit a first-time shot on goal, only to see the ball clear the crossbar. Minutes later, the Edinburgh side appealed for a penalty when Murray Cockburn fell in the box under pressure from the Dunipace defence. The referee said no and the game continued with both sides working hard to take the lead. Oxgangs thought they were about to take the lead when Blackie played in Murray Cockburn but a last-ditch tackle from Mark Black prevented the goal. It livened up the Stirlingshire side, who started to control the game more, looking a more threatening outfit. Dunipace should have broken the deadlock a few minutes later. Conlyn Comrie’s free kick found Andy Meade but his header went wide of the target. As the half wore on Dunipace took the initiative, continuing to cause problems at the heart of the opposition’s defence. Erik Mitusch went on a mazy run down the left before teeing up Sean Brown his shot was saved comfortably by keeper Robbie Brown. After continuing to persevere, Dunipace were finally rewarded with a goal five minutes before the break. Comrie whipped in a free kick from the right which completely deceived Robbie Brown in the Oxgangs goal and found the bottom right corner. Dunipace could have doubled their lead at the start of the second half. Sean Brown got on the end of Ross Weir’s cross in the area but could only send a shot into the arms of Robbie Brown. They continued to attack and the ball dropped to Weir in the area. It looked to be a certain goal but Sam Leslie got a block in to deny the substitute. As their cup dreams looked to be fading, Oxgangs pushed even more bodies forward and came inches away from sending the game to extra time. Paul Macari directed a shot at goal which hit the inside of the post and bounced away, and Dunipace were confirmed as South East Region Cup winners. Lewis Murray - Provided fresh attacking output once coming on, in what was Oxgangs best spell of the game late on. Sean Brown - Was a constant threat for his side, spearheading the Dunipace attack. He was unlucky not to have got on the scoresheet. Paul Macari was very close to taking the match to extra time when his last-minute shot hit the post. Conlyn Comrie's free kick found the back of the net to give Dunipace Juniors the victory.